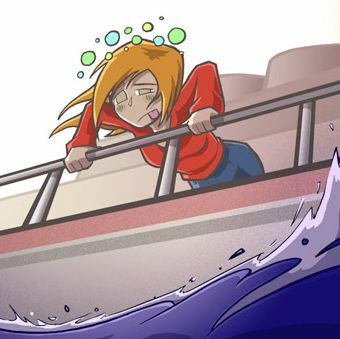 Travel sickness, or motion sickness, is when you feel sick or vomit because you are moving. Persons most commonly affected: Children experience travel sickness more often than adults, but they often grow out of it as they get older. Symptoms and indications: Symptoms of travel sickness may include: nausea, vomiting, yawning, becoming cold and sweaty and turning pale, producing excess saliva, rapid breathing, and headaches. These symptoms often worsen as the journey continues, but usually get better quickly, once the journey is over. In a few people the symptoms go on for a few hours, or even days, after the journey ends. Causes and risk factors: It is caused by repeated unusual movements during travelling. This includes travel in a vehicle such as a car, plane or boat, and other activities such as fairground rides. Prevention: Do not eat large meals or drink alcohol before or during travelling. In a car, sit in the front seat if possible so you can get a clear view of the road. Do not focus on something close by such as a book or film. Look at objects in the distance, or better still, close your eyes and try to sleep. Make sure the car is well ventilated. Stop for a break and a stretch regularly throughout the journey. On a boat, go on deck and get as much fresh air as possible and focus on the horizon. If you cannot go outside, sit in the middle of the boat, where it moves least. If you feel sick lie down and keep your eyes closed. In a plane, try and sit over the wings where it is most stable. If you are sick, replace lost fluids with frequent small sips of cold, still water and breathe slowly and deeply through your mouth.